Aforementioned, Posted by James Wallace at June 12, 2007 1:41 a.m. Category: 787 Dreamliner; This could be part of the problem. Structural integrity issues were called upon in the delay, a very serious issue. (seatlepi) James Wallace on Aerospace - Update on problems joining 787 fuselage sections Boeing told me Monday that workers have finally joined the nose section of the 787 to the forward fuselage, but a spokeswoman admitted the two composite fuselage barrels were not a seamless fit and the solution proved "challenging.'' The Everett factory source I previously quoted in this blog as saying there were unexpected problems in trying to join fuselage sections told me that loads had to be applied by engineers to finally connect the forward and nose sections. This required that some internal structure installed before the sections arrived in Everett be removed to make the massive one-piece composite barrels less rigid, the source said. This also added to the growing work load that Boeing faces in order to meet the July 8 rollout date. Boeing engineers calculated the amount of hydraulic load that could be safely applied to the structures to force the sections to fit, the source said. The problem was on the left side of section 41 -- the nose and cockpit -- manufactured by Spirit AeroSystems in Wichita. A bulge of more than an inch and a half was discovered when that section was initially lined up in tooling to be connected with the forward fuselage section 43, manufactured by Kawasaki in Japan, the source said. Section 41 arrives from Wichita as one piece. Section 43 is connected in Charleston, S.C., with mid fuselage sections 46 and 44 that are manufactured by Alenia in Italy. That entire fuselage structure is flown to Everett for final assembly. Boeing acknowledge Monday there was a problem joining sections 41 and 43. But the 787 spokeswoman said this had been accomplished successfully in the past week and "we have moved on to the next challenge.'' Contrary to growing rumors that the 787 will be delayed, she said nothing has been encountered so far during final assembly of the first plane -- or with Boeing's partners (the firing of the 787 Vought executive) -- that would delay the official rollout on July 8, first flight or first 787 delivery next May to All Nippon Airways of Japan. She did say that Boeing would not continue to comment on specific issues that might come up during final assembly and which are subsequently disclosed by media. This was in response to questions from me about the problems connecting the two fuselage sections as well as what I'm told is a delay in attaching the 787 engine pylons to the wings. My source said the delay is the result of about 8,000 temporary fasteners in the wings. The engine pylons can't be attached to the wings until the temporary fasteners are replaced. But the source also said the temporary fasteners are being replaced with permanent ones as they arrive. The 787 spokeswoman did say any serious issues that might delay the 787 would be quickly disclosed. 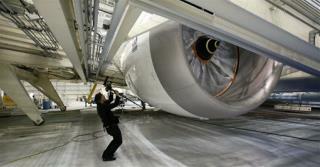 Boeing has acknowledged a serious shortage of 787 fasteners.